Colorful, fun, educational and even attractive for your table. Illustration of proper table setting along with table etiquette reminders printed on placemats. Laminated for easy cleaning. 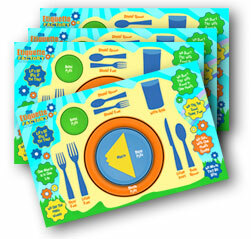 Once a week, choose 1 dining etiquette skill from the placemat for the whole family or class to improve on. Remember, positive reinforcement is key. 4 Placemats in the Pack.